A kind of busy night for the New York Ranger and New York Islander prospects with 5 key games going on with a variety of results. The star on Wednesday was goalie Mackenzie Skapski (NYR 2013 6th) of the Kootenay Ice as the young goalie earned his game's 2nd star with a 39 save effort leading his Kootenay Ice to a 3-1 win over the Medicine Hat Tigers in game 3 of their series. Skapski who had a terrible first round series finally showed the form that most were expecting out of him against Calgary. This was no question Skapski's best effort in the playoffs as he kept the Tigers off the scoreboard until the 3rd period and didn't give them very much after that. The win was Skapski's 3rd of the playoffs and helped lower his stats to a 3.89 goals against and a 0.883 save percentage. Now the test for Skapski is can he turn around and repeat the effort on Thursday in game 4 in order to protect home ice in this series for his Ice? Ryan Graves (NYR 2013 4th) and his Val-d'Or Foreurs got off to a slow start in game 4 of their series against the Drummondville Voltigeurs and paid for it with a 3-2 loss which evened the series at 2-2. The Foreurs got off to a rough start when Graves took a bad hooking penalty just 50 seconds into the 1st period. The Foreurs killed that one off but were able to establish tempo and took advantage of it to grab a 2-0 lead after the 1st period. The Foreurs despite a 41-29 edge in shots could only muster 2 goals in the 2nd period just 24 seconds apart. It was more like the Foreurs were playing not to lose and it gave the Voltigeurs the opening they needed to punch in a goal late in the 3rd period. Now it is back to Val-d'Or for game 5 on Friday evening. Griffin Reinhart (NYI 2012 1st) and his Edmonton Oil Kings let Ryan Pulock's (NYI 2013 1st) Brandon Wheat Kings off the hook in game 4 as the Oil Kings lost 5-2 to send the series back to Edmonton for game 5. Neither Reinhart or Pulock scored but Pulock was much more active than he has been in any of the other games and that helped Brandon tremendously. The series will shift back to Edmonton for game 5 on Friday night. Edmonton does not want to let Brandon have any more life than they do or else it might come back to haunt them later on. Finally Loic Leduc (NYI 2012 4th) and his Rimouski Oceanic lost their composure and then game 4 to the Blainville-Boisbriand Armada 5-1 to even their series at 2-2. Rimouski just played a undisciplined game (giving up 10 power plays) and instead of a 3-1 lead heading home will have given the Armada new life. 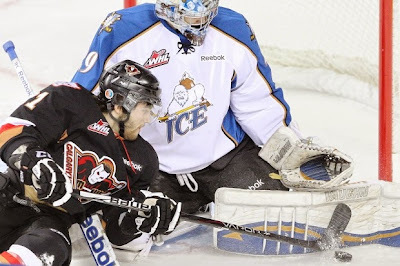 Leduc was of course scoreless on 2 shots with minors for slashing and high-sticking and no registered hits. Game 5 because of the travel format remains in Blainville-Boisbriand on Friday night. Brady Skjei (NYR 2012 1st), Taylor Cammarata (NYI 2013 3rd) and Jake Bischoff (NYI 2012 6th) weill lead their Minnesota Golden Gophers up against old rival North Dakota in the 2nd semifinal of the NCAA's Frozen Four. Catch the game starting at 8:30 PM EDT on ESPN2.